Made by Reutter in Germany, one of the premier miniature makers. 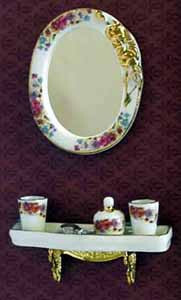 Oval Mirror and shelf in white porcelain with gilt brackets. The shelf holds a brush, perfume bottle and 2 beakers.